There is no single “right way” to do lighting in Daz Studio Iray. In this tutorial, I will describe my lighting process, which is geared towards figure based compositions. In particular, my images focus on one or a small number of actors, and everything else is built around those figures. An image based light (IBL). This is a HDR image that I use in Render Settings > Environment > Environment Map. Three mesh lights arranged according to the three-point light system. One or more volumetric lights for softening effects and atmosphere. Then, I may add point-lights or emissive surfaces based on composition. We will use the image above to illustrate the different classes of lights and why we use them, in this tutorial. 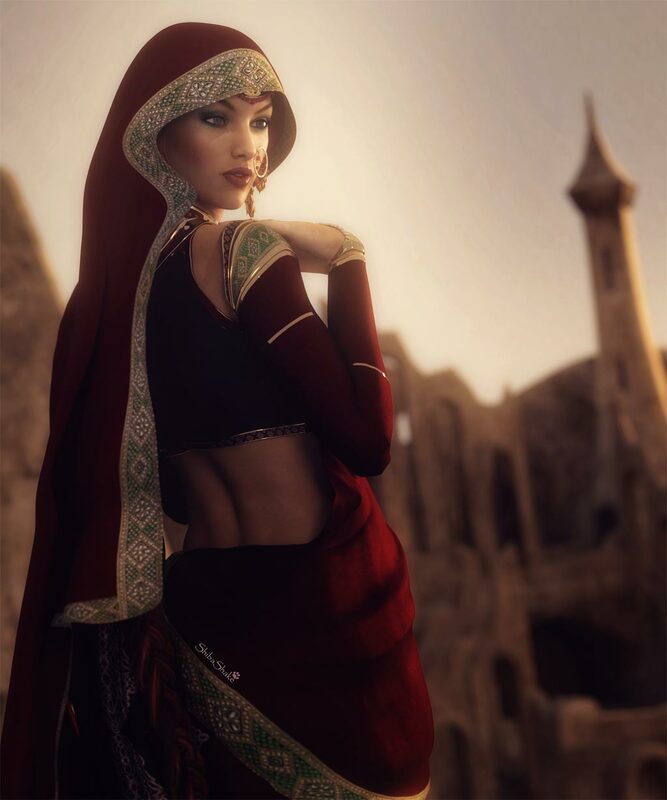 The outfit and hair used in the image are from the NeoIndia Outfit and Hair Bundle by Arki and Shox-Design. The ruins in the backdrop is Mandgadfor by powerage. Realistic background that is consistent with both lighting and reflections. This beginner Iray tutorial has more on how I use a HDR image in Daz Studio Iray. How well our IBL illuminates the scene will depend in large part on the HDR image we are using. In particular, what range of values it supports. The higher the range, the better the results. I think about it this way … sunlight is a very strong light source, and its value should be many many times greater than anything else in the scene. Using a regular JPG image that only supports 255 values per pixel, is not going to work well for scene lighting. This is because the difference in range between our very bright sunlight and everything else will be overly compressed. I.e. a lot of light information in our IBL would be lost due to range limits. A decent JPG can serve as a good enough background, but it will not be sufficient for providing good realistic scene lighting. Below is our Princess of the East image, with just the IBL turned on. Here, we are using the Barcelona Rooftops HDRI from sIBL Archives. Here is a list of free HDRi sites. Dimension Theory and Orestes Graphics also has some great HDRi’s for Iray. Scene lighted with just an IBL (Iray Environment Map). If we are already using a good HDR image, why do we need to add mesh lights? I add mesh lights to highlight my main figure(s) and make them stand-out from the rest of the scene. 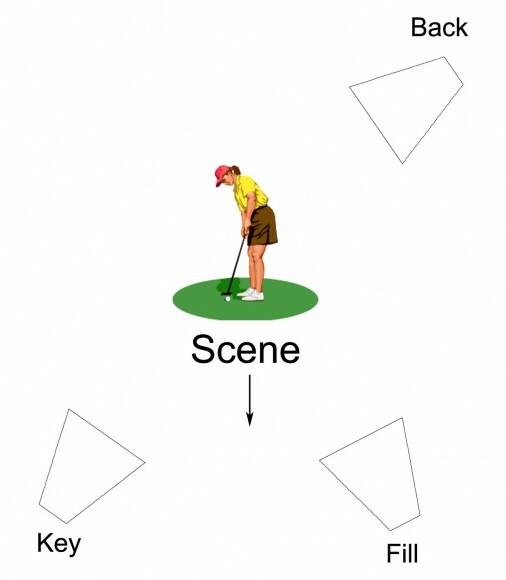 This is especially important in figure based compositions, because the focus of the image is on the main actor(s) in the scene. I think about it this way … when we go out walking in the streets, the scene around us is very busy. Although we may imagine ourselves to be the center of attention, no single individual stands out from the rest. This is what we get with a HDR image. In contrast, during a model photo-shoot, lights are added to bring out the figure so that it grabs the viewer’s attention. To highlight my main figure(s), I add three Daz Studio spotlights (Create > New Spotlight). I place my three lights according to the three-point light system (key, fill, back). Then, I convert each of my spotlights into mesh lights by setting the Light Geometry parameter to Rectangle. This will give me softer shadows. For more details on how to convert a spotlight into a mesh light refer to this article. I want my back light to have the sharpest shadows, so I set its size to be the smallest of the three. I want my fill light to have the softest shadows, so it gets the largest rectangle. The key light is somewhere in-between the two. Finally, I select my three lights and add them to a group (Create > New Group), so that I can move them and rotate them together. 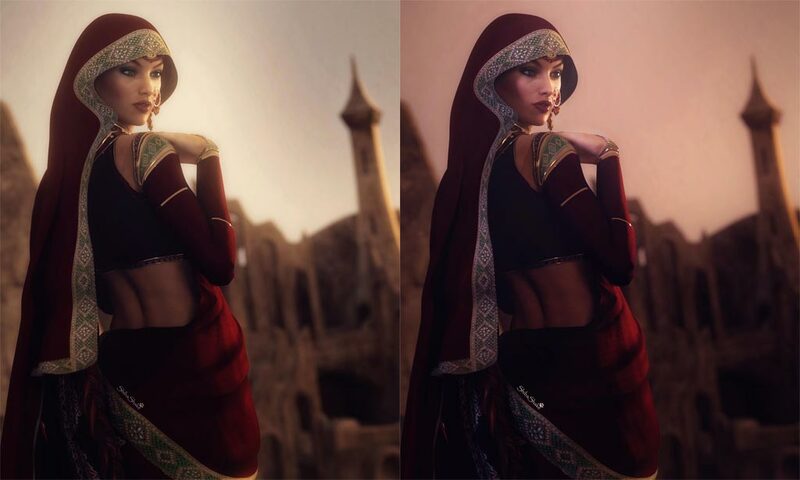 In this way, I can easily center my three lights around the main figures within my Daz Studio scene. To bring out my main figure(s), I add three lights according to the three-point light system. After adding the three mesh lights to my IBL, my figure stands out a lot more from the background, and there is a much stronger silhouette on my figure. If we compare this image and the previous one, with just the IBL, we can clearly see that the lighting is more compelling here and the figure pops from the background. If you do not want to create a light rig from scratch, the BOSS Pro Light Set for Portraits & Promos has ready-made key, fill, rim lights, and much more. After adding my three mesh lights to my IBL, my figure stands out a lot more from the background. I also like to add at least one volumetric light to my images to provide additional shadows and atmosphere. In this case, I add a spotlight shining onto my figure’s face. I then render it as a volumetric light by using Marshian’s AtmoCam for Iray. You can also create your own volumetric light. Here are a few ways. Add a volumetric spotlight shining on our figure’s face. This adds more shadows and atmosphere. Finally, I re-tone the image some, add a little bit of glow, add some contrast, and I am done! You will notice that I do not talk much about light intensities in this tutorial. This is because I usually render each light in a separate layer, and later combine them in Photoshop. I control intensity, tint, and more from within Photoshop. Depending on how I combine these lights, I can create a day-time scene or a sunset scene. I can create a realistic image or a colorful fantasy setting. By combining lights differently in Photoshop, I can get a day-time or sunset scene; a realistic or a fantasy scene. In this tutorial we focus on the three water shaders in Daz Studio Iray - water, water thin, and water dispersive. We also experiment with an underwater mermaid scene and water caustics. I took some of this advice with this image. It took a few tries to get the lighting right. Had to tone down the rock diffuse color a lot to get the balance I wanted. https://polyrender.deviantart.com/art/Fallen-Angel-744147082 I used atmocam for a volume layer and then made the rays by creating a mask using Filter Forge. Actually just using FF would probably be a lot faster than messing with volume. 3 renders at 2000 X 1600. Each one only took about half hour a piece. Very nicely done! Yeah, I usually turn down the diffuse of background items. There are also ray props, but I like using atmocam because then the rays and shadows cast are based on the objects in the scene. Excellent. I didn’t know you could convert spots to meshes. Will have to try that trick. Have you written a how to on your Iray Atmocam usage? I have it and sometimes use it but it looks like you are confining it to a small area. Or perhaps it is just one of your light passes. I used to render in light layers with 3DL but haven’t done that much with Iray since the more light, the faster it goes (though, with 3 GTX-1080s, I don’t worry about speed much). Oh wait, I guess I already do that with spot lights, only I usually use sphere or disc. Yeah, I use Atmocam is a separate light pass, so that I can limit it to specific lights. It may be possible to do this in a single pass in Iray with canvasses, but I haven’t really looked deeply into that. hi boss, how Mesh Lights to HDR Image? Thanks!!! I have not done that before, so have no idea. Google probably knows, and Dimension Theory has a bunch of HDR light sets that may help. I’ve read the comments and I have a question 🙂 how do you render the lights manually? Like you click the eye to turn the ibl light while he other lights are off then render, then turn on the key light while the other lights are turned off then render, etc? Also I’m not in my computer right now but I’d also ask this just to be sure, is IBL the environment light? If it is how can you have an ibl inside a building like what you’ve suggested in one of the comments. Thanks! Like you click the eye to turn the ibl light while he other lights are off then render, then turn on the key light while the other lights are turned off then render, etc? Yes, that is what I currently do. I’d also ask this just to be sure, is IBL the environment light? Thanks for this great tutorial — I’m a complete dunce when it come to lighting an IRAY scene. I do have a question though (don’t we always?) I’m trying to do a scene which includes actual scenery, the Helena Tomb. I’ve created a three point light rig for my character, but when I render it’s coming out really dark because I’m not using an IBL light. Can I use an IBL light even though I have a building in the scene? I guess I could give it a try and see – but wondered what your thoughts are on this. Yes, you can use an IBL light in whatever scene. However, you want to make sure that that buildings/scene objects are not blocking your light from the main character(s). I especially like the mesh lights after HDR. Pops like a light wrap. Any advice on where to learn about multipass rendering in iray Daz? I get that the LPE passes is where you get the renders, but the process is not easy. Any resources you know of? Great tutorial by Esemwy on rendering light groups to different layers. However, I render things manually a lot of the time since I have to do my volumetric layer(s) separately anyway, and I am now playing with multiple environment maps. What character is it ? Mix of Eva7 and Victoria7.